46 I WRAPS I 2015 easier installation and faster removal. They are slideable and repositionable, and "conformable on demand" so they stretch up to 150 percent when needed. But the feature that is most valuable to me is that they can be installed in extreme temperatures. The film doesn't get too soft or stretchy in warm weather, and it does not become brittle in cold temperatures. Because I live in Texas and perform many installations here, the ability to work outdoors even during hot and cold weather helps me work more efficiently. A 90-degree day with 20 mph winds is now nothing to worry about. With this combination of features, installers' limits are reduced—we can now apply film in a wider range of weather conditions and still have a forgiving material with high conformability and great tensile strength. For small graphics businesses, staying up to date on material options like this can help owners gain a competitive edge. I recently completed a project at a very large corporation, and the small sign shop that had won the job did so because they offered 3M Envision Wrap Films. I recommend that graphics manufacturers that have not incorporated more sustainable materials into their offerings should do so—it's something that customers will increasingly ask about in the future, and the ability to demonstrate expertise and answer their questions quickly can be a great advantage. 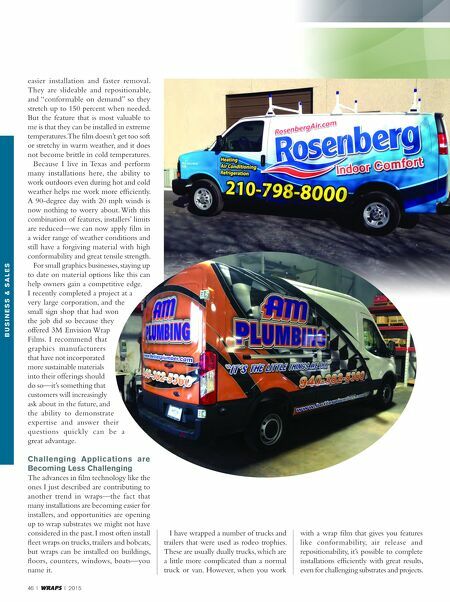 Challenging Applications are Becoming Less Challenging The advances in film technology like the ones I just described are contributing to another trend in wraps—the fact that many installations are becoming easier for installers, and opportunities are opening up to wrap substrates we might not have considered in the past. 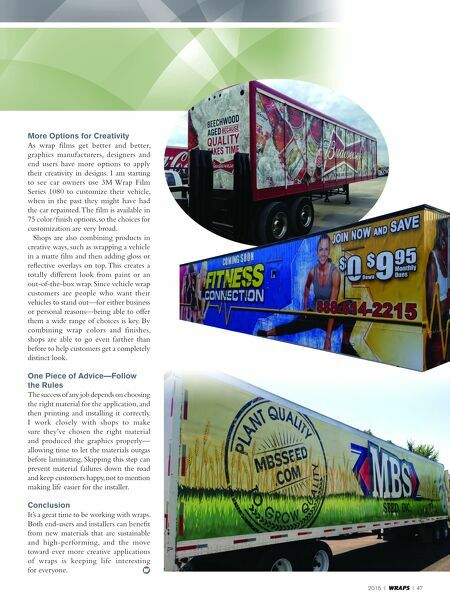 I most often install fleet wraps on trucks, trailers and bobcats, but wraps can be installed on buildings, floors, counters, windows, boats—you name it. B u s i n e s s & s A L e s I have wrapped a number of trucks and trailers that were used as rodeo trophies. These are usually dually trucks, which are a little more complicated than a normal truck or van. However, when you work with a wrap film that gives you features like conformability, air release and repositionability, it's possible to complete installations efficiently with great results, even for challenging substrates and projects.